Community College in front – Bruce Lee in Back | JIFFY FEET – Southern Fried Awesome! Community College in the front – Bruce Lee in the Back, originally uploaded by jiffyfeet. Chris Day/Night’s little cousin Merritt (yes he is a bad influence) snagged this pic while on campus in Ocala. 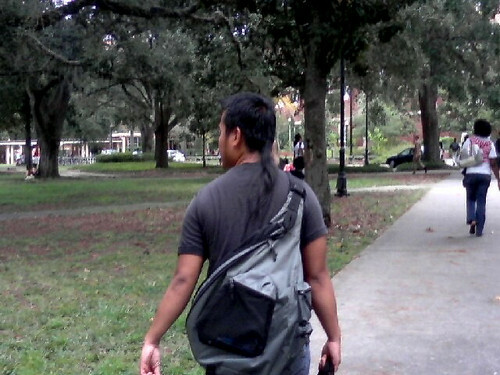 I called it “Bruce Lee in the back” because unlike a full mullet which can be spotted from great distances… The Rat tail will sneak up on you like a ninja from behind and karate chop you in the neck. But lets not forget, it’s still a member of the mullet family. One Comment on "Community College in front – Bruce Lee in Back"
Ocala fan club is growing….nice shot Merritt. Now get back to not studying.